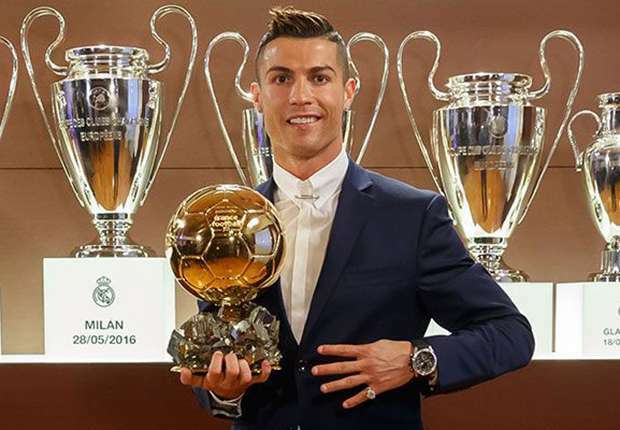 Portuguese superstar Cristiano Ronaldo won the 2016 Ballon d’Or award last night by a whopping margin of 429 points ahead of Argentine wonder boy Lionel Messi while French superstar Antoine Griezmann was placed third. The French bi-weekly football magazine, France Football, in September announced the end of their partnership with world football governing body, FIFA for the FIFA Ballon d’Or award that was jointly presented by them to the best football player of the world each year from 2010-2015. Hence, this year’s Ballon d’Or was the 61st edition of the award. Ronaldo had a brilliant year, winning the UEFA Champions League with Real Madrid as well as his maiden glory with Portugal, the Euro 2016. He scored 51 goals and racked up 17 assists this year. Although by his insane standards, these numbers look a bit pale; it was his influence for Real and Portugal that shone above all these figures and statistics. He played an integral part in Madrid’s road to the Champions League final and was also the top scorer of the tournament with 16 goals. At the Euro, Ronaldo scored three goals and provided three assists, winning the Silver Boot award in the tournament. He limped off from the final after only 18 minutes but Portugal ultimately won the tournament. His rival, Leo Messi, meanwhile had a superb year as well. Messi won the domestic double of La Liga and Copa Del Rey as well as the Spanish Super Cup with Barcelona and led Argentina to the finals of Copa America Centenario 2016. His side ultimately lost the finals in penalties where Messi unfortunately missed from his spot kick. Nevertheless, in terms of goalscoring, Messi has been simply phenomenal in 2016. He scored 58 goals and provided 32 assists altogether in 2016. He also scored five goals at Copa America. However, despite winning three tournaments in 2016, the lack of European and national level success for Barcelona and Argentina diminished his chances of winning the Ballon d’Or. Ronaldo won the two tournaments that had more weightage (UCL and Euro) in comparison to the ones won by Messi. Had Messi won Copa America, the balance would have titled strongly towards him. For any other year, what Messi achieved in 2016 with his club and national team would have been sufficient for winning the Ballon d’Or. But 2016 was different. The defeat in the Copa America final and Barcelona being eliminated from the quarterfinals of Champions League placed him at second, just behind Ronaldo for the award. 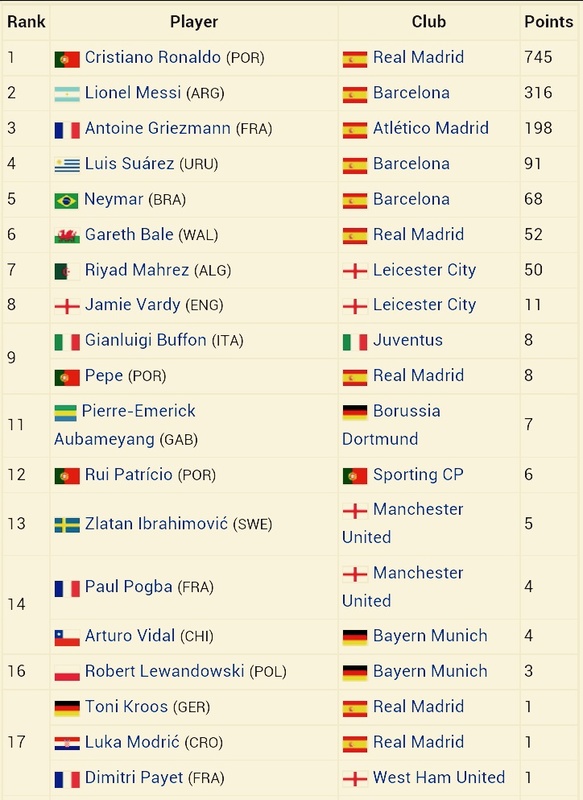 Antoine Griezmann was third in the Ballon d’Or rankings. He had an amazing year with Aletico Madrid and France. 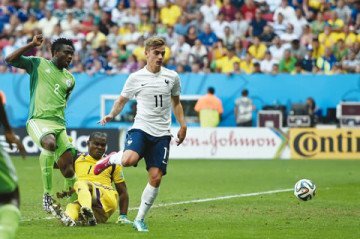 He won the Golden Shoe award of Euro 2016 with six goals and two assists and was also adjudged to be the Player of the tournament. However, defeats in the Champions League and Euro finals undid his chances of winning the coveted prize. Messi’s Barca temmates, Suarez and Neymar were placed fourth and fifth in the rankings respectively. Suarez completely deserved his place as he was the top goalscorer of La Liga in 2015/16 season. Bale ranked sixth in the list, after playing a vital role in Real Madrid’s Champions League glory and leading Wales to the Euro semifinals for the first time in history. Leicester City teammates, Mahrez and Vardy were placed seventh and eighth in the rankings respectively. Vardy and Mahrez spent a sensational season at Leicester after leading the side to their maiden Premier League glory. Italian veteran goalkeeper Buffon along with Pepe of Portugal/Real Madrid was jointly placed ninth in the rankings. Buffon guided Juventus to yet another Serie A championship and also led Italy to the quarterfinals of Euro 2016. Meanwhile, Pepe was arguably the best player for Portugal in Euro and played a pivotal role as always in Madrid’s defence lineup in 2016. CR7 deservedly won the Ballon d’Or. But he may have more awards lined up as 2016 nears its end. FIFA will host the Best FIFA Football Awards 2016 next year at Zurich, Switzerland. Ronaldo, along with Messi and Griezmann is among the top three recipients of that award. It will be intriguing to see if he can claim that silverware too in January 2017.